The Germanic tribes, an ancient nomadic civilization, used their superior military strength to lay the foundation for modern Europe. The Germanic people were a diverse group of migratory tribes with common linguistic and cultural roots who dominated much of Europe during the Iron Age. When the Roman Empire lost strength during the 5th century, Germanic peoples migrated into Great Britain and Western Europe, and their settlements became fixed territories. Various Germanic tribes migrated into Italy, Gaul, Spain, and North Africa. Many Germanic tribes merged, including the Jutes with the Danes in Denmark, the Geats and Gutes with the Swedes in Sweden, and the Angles with the Saxons in England. Germanic peoples had a strong military, and warriors were fiercely devoted to their military leaders, or chieftains. Political leaders Odoacer and Theoderic the Great shaped later European civilizations. nomadic: Leading a wandering life with no fixed abode; peripatetic, itinerant. retinues: Bodies of persons “retained” in the service of a noble or royal personage. The Germanic peoples (also called Teutonic, Suebian, or Gothic in older literature) are an ethno-linguistic Indo-European group of northern European origin. They are identified by their use of Germanic languages, which diversified out of Proto-Germanic during the Pre-Roman Iron Age. The term “Germanic” originated in classical times when groups of tribes living in Lower, Upper, and Greater Germania were referred to using this label by Roman scribes. These tribes generally lived to the north and east of the Gauls. They were chronicled by Rome ‘s historians as having had a critical impact on the course of European history during the Roman-Germanic wars, particularly at the historic Battle of the Teutoburg Forest, where the vanquishment of three Roman legions at the hands of Germanic tribal warriors precipitated the Roman Empire’s strategic withdrawal from Magna Germania. As a linguistic group, modern Germanic peoples include the Afrikaners, Austrians, Danes, Dutch, English, Flemish, Frisians, Germans, Icelanders, Lowland Scots, Norwegians, Swedes, and others (including diaspora populations, such as some groups of European Americans). Northernmost Europe, in what now constitutes the European plains of Denmark and southern Scandinavia, is where the Germanic peoples most likely originated. This is a region that was “remarkably stable” as far back as the Neolithic Age, when humans first began controlling their environment through the use of agriculture and the domestication of animals. Archeological evidence gives the impression that the Germanic people were becoming more uniform in their culture as early as 750 BCE. As their population grew, the Germanic people migrated westwards into coastal floodplains due to the exhaustion of the soil in their original settlements. By approximately 250 BCE, additional expansion further southwards into central Europe took place, and five general groups of Germanic people emerged, each employing distinct linguistic dialects but sharing similar language innovations. These five dialects are distinguished as North Germanic in southern Scandinavia; North Sea Germanic in the regions along the North Sea and in the Jutland peninsula, which forms the mainland of Denmark together with the north German state of Schleswig-Holstein; Rhine-Weser Germanic along the middle Rhine and Weser river, which empties into the North Sea near Bremerhaven; Elbe Germanic directly along the middle Elbe river; and East Germanic between the middle of the Oder and Vistula rivers. Some recognizable trends in the archaeological records exist, as it is known that, generally speaking, western Germanic people, while still migratory, were more geographically settled, whereas the eastern Germanics remained transitory for a longer period. Three settlement patterns and solutions come to the fore; the first being the establishment of an agricultural base in a region that allowed them to support larger populations; the second being that the Germanic peoples periodically cleared forests to extend the range of their pasturage; and the third (and the most frequent occurrence) being that they often emigrated to other areas as they exhausted the immediately available resources. War and conquest followed as the Germanic people migrated, bringing them into direct conflict with the Celts who were forced to either Germanize or migrate elsewhere as a result. West Germanic people eventually settled in central Europe and became more accustomed to agriculture, and it is the various western Germanic people that are described by Caesar and Tacitus. Meanwhile, the eastern Germanic people continued their migratory habits. Roman writers characteristically organized and classified people, and it may very well have been deliberate on their part to recognize the tribal distinctions of the various Germanic people so as to pick out known leaders and exploit these differences for their benefit. For the most part however, these early Germanic people shared a basic culture, operated similarly from an economic perspective, and were not nearly as differentiated as the Romans implied. In fact, the Germanic tribes are hard to distinguish from the Celts on many accounts simply based on archaeological records. During the 5th century, as the Western Roman Empire lost military strength and political cohesion, numerous nomadic Germanic peoples, under pressure from population growth and invading Asian groups, began migrating en masse in various directions, taking them to Great Britain and far south through present-day Continental Europe to the Mediterranean and Northern Africa. Over time this wandering meant intrusions into other tribal territories, and the ensuing wars for land escalated with the dwindling amount of unoccupied territory. Wandering tribes then began staking out permanent homes as a means of protection. This resulted in fixed settlements from which many tribes, under a powerful leader, expanded outwards. Ostrogoths, Visigoths, and Lombards made their way into Italy; Vandals, Burgundians, Franks, and Visigoths conquered much of Gaul; Vandals and Visigoths also pushed into Spain, with the Vandals additionally making it into North Africa; and the Alamanni established a strong presence in the middle Rhine and Alps. In Denmark, the Jutes merged with the Danes; and in Sweden, the Geats and Gutes merged with the Swedes. In England, the Angles merged with the Saxons and other groups (notably the Jutes), and absorbed some natives, to form the Anglo-Saxons (later known as the English). Essentially, Roman civilization was overrun by these variants of Germanic peoples during the 5th century. Germanic people were fierce in battle, creating a strong military. Their love of battle was linked to their religious practices and two of their most important gods, Wodan and his son, Thor, both believed to be gods of war. The Germanic idea of warfare was quite different from the pitched battles fought by Rome and Greece, and the Germanic tribes focused on raids to capture resources and secure prestige. Warriors were strong in battle and had great fighting abilities, making the tribes almost unbeatable. Men began battle training at a young age and were given a shield and a spear upon manhood, illustrating the importance of combat in Germanic life. The loss of the shield or spear meant a loss of honor. The Germanic warrior’s intense devotion to his tribe and his chieftain led to many important military victories. Chieftains were the leaders of clans, and clans were divided into groups by family ties. The earlier Germans elected chieftains, but as time went on it became hereditary. One of the chieftain’s jobs was to keep peace in the clans, and he did this by keeping the warriors together and united. Military chieftains relied upon retinues, a body of followers “retained” by the chieftain. A chieftain’s retinue might include, but was not limited to, close relatives. The followers depended on the retinue for military and other services, and in return provided for the retinue’s needs and divided with them the spoils of battle. This relationship between a chieftain and his followers became the basis for the more complicated feudal system that developed in medieval Europe. Political and diplomatic leaders, such as Odoacer and Theoderic the Great, changed the course of history in the late 400s CE and paved the way for later kings and conquerors. Odoacer, a German general, took over the Western Roman Empire in his own name, becoming the first barbarian king of Italy. Theoderic the Great became a barbarian king of Italy after he killed Odoacer. He initiated three decades of peace between the Ostrogoths and the Romans and united the two Germanic tribes. Theoderic the Great: Bronze statue of Theoderic the Great, king of the Ostrogoths, by Peter Vischer the Elder (1512-13) at the tomb of Emperor Maximilian I in the Court Church in Innsbruck, Austria. Odoacer was a Germanic soldier in the Roman army who deposed emperor Augustulus and became the first King of Italy, marking the end of the Western Roman Empire, the fall of ancient Rome, and the beginning of the Middle Ages in Western Europe. Odoacer was a Germanic soldier in the Roman army who in 476 became the first King of Italy. At the time, Rome used many mercenary armies from other nations, called foederati, who with the rise of Emperor Augustulus became frustrated by their treatment and status. These armies, led by Odoacer, revolted against Emperor Augustulus and deposed him in 476, and granted Odoacer kingship. Odoacer cooperated with the existing Roman Senate and elevated them to prestige, thereby stabilizing his power in Italy. As Odoacer’s position improved, Zeno, the Eastern Emperor, increasingly saw him as a rival, and in response pitted the Ostrogoth Theoderic the Great against him; Theoderic proved victor against Odoacer repeatedly and eventually killed him in 493. 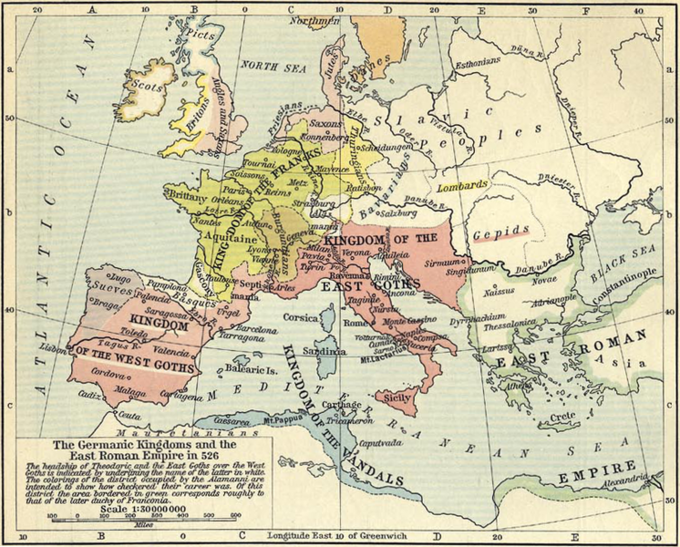 Western Roman Empire: The western provinces of the Roman Empire at any one time during which they were administered by a separate independent imperial court, coequal with (or only nominally subordinate to) that administering the eastern provinces. foederati: Any one of several outlying nations to which ancient Rome provided benefits in exchange for military assistance. The term was also used, especially under the Roman Empire, for groups of “barbarian” mercenaries of various sizes, who were typically allowed to settle within the Empire. Romulus Augustulus: An emperor of the Western Roman Empire from 475–476 AD; his deposition by Odoacer traditionally marks the end of the Western Roman Empire, the fall of ancient Rome, and the beginning of the Middle Ages in Western Europe. Arian Christian: A Christian sect that asserts that Jesus Christ is the Son of God who was created by God the Father at a point in time, is distinct from the Father, and is therefore subordinate to the Father. Flavius Odoacer (433–493) was a soldier, probably of Scirian descent, who in 476 became the first King of Italy (476–493). His reign is commonly seen as marking the end of the Western Roman Empire. Though the real power in Italy was in his hands, he represented himself as the client of Julius Nepos and, after Nepos’s death in 480, of the Emperor in Constantinople. Odoacer generally used the Roman honorific patrician, granted by the Emperor Zeno, but is referred to as a king (Latin rex) in many documents. He used the term “rex” himself at least once, and on another occasion it was used by the consul Basilius. Odoacer introduced few important changes into the administrative system of Italy. He had the support of the Roman Senate and was able to distribute land to his followers without much opposition. Unrest among his warriors led to violence in 477–478, but no such disturbances occurred during the later period of his reign. Although Odoacer was an Arian Christian, he rarely intervened in the affairs of the orthodox and trinitarian state church of the Roman Empire. Coin of Odoacer: Coin of Odoacer, Ravenna, 477, with Odoacer in profile, depicted with a “barbarian” moustache. Odoacer was a military leader in Italy who led the revolt of Herulian, Rugian, and Scirian soldiers that deposed Romulus Augustulus on September 4, 476. Augustulus had been declared Western Roman Emperor by his father, the rebellious general of the army in Italy, less than a year before, but had been unable to gain allegiance or recognition beyond central Italy. In 475 a Roman general named Orestes was appointed Magister militum and patrician by the Western Roman Emperor Julius Nepos and became head of the Germanic foederati (barbarian mercenary armies for Rome). However, Orestes proved to be ambitious, and before the end of that year drove Nepos from Italy. Orestes then proclaimed his young son Romulus the new emperor, Romulus Augustulus. However, Nepos reorganized his court in Salona, Dalmatia, and received homage and affirmation from the remaining fragments of the Western Empire beyond Italy and, most importantly, from Constantinople, which refused to accept Augustulus and branded him and his father traitors and usurpers. At around this time, the foederati, who had been quartered on the Italians all of these years, had grown weary of this arrangement. In the words of J. B. Bury, “They desired to have roof-trees and lands of their own, and they petitioned Orestes to reward them for their services, by granting them lands and settling them permanently in Italy.” Orestes refused their petition, and they turned to Odoacer to lead a revolt against Orestes. Orestes was killed at Placentia, and his brother Paulus killed outside Ravenna. The Germanic foederati, the Scirians, and the Heruli, as well as a large segment of the Italic Roman army, then proclaimed Odoacer rex Italiae (“king of Italy”). In 476 Odoacer advanced to Ravenna and captured the city, compelling the young emperor Romulus to abdicate on September 4. According to the Anonymus Valesianus, Odoacer was moved by Romulus’s youth and beauty to not only spare his life, but also to give him a pension of 6,000 solidii and send him to Campania to live with his relatives. In 476, Odoacer became the first barbarian King of Italy, initiating a new era. With the backing of the Roman Senate, Odoacer thenceforth ruled Italy autonomously, paying lip service to the authority of Julius Nepos, the last Western emperor, and Zeno, the emperor of the East. Upon Nepos’s murder in 480, Odoacer invaded Dalmatia to punish the murderers. He did so, executing the conspirators, but within two years also conquered the region and incorporated it into his domain. As J.B. Bury points out, “It is highly important to observe that Odovacar established his political power with the co-operation of the Roman Senate, and this body seems to have given him their loyal support throughout his reign, so far as our meagre sources permit us to draw inferences.” He regularly nominated members of the Senate to the Consulate and other prestigious offices: “Basilius, Decius, Venantius, and Manlius Boethius held the consulship and were either Prefects of Rome or Praetorian Prefects; Symmachus and Sividius were consuls and Prefects of Rome; another senator of old family, Cassiodorus, was appointed a minister of finance.” A. H. M. Jones also notes that under Odoacer the Senate acquired “enhanced prestige and influence” in order to counter any desires for restoration of Imperial rule. As the most tangible example of this renewed prestige, for the first time since the mid-3rd century copper coins were issued with the legend S(enatus) C(onsulto). As Odoacer’s position improved, Zeno, the Eastern Emperor, increasingly saw him as a rival. When Illus, master of soldiers of the Eastern Empire, asked for Odoacer’s help in 484 in his struggle to depose Zeno, Odoacer invaded Zeno’s westernmost provinces. Zeno responded first by inciting the Rugi of present-day Austria to attack Italy. During the winter of 487–488 Odoacer crossed the Danube and defeated the Rugi in their own territory. In his quest to destroy Odoacer, Zeno promised Theoderic the Great and his Ostrogoths the Italian peninsula if they were to defeat and remove Odoacer from power. In 489, Theoderic led the Ostrogoths across the Julian Alps and into Italy. On August 28, Odoacer met him at the Isonzo, only to be defeated. He withdrew to Verona, reaching its outskirts on September 27, where he immediately set up a fortified camp. Theoderic followed him and three days later defeated him again. While Odoacer took refuge in Ravenna, Theoderic continued across Italy to Mediolanum, where the majority of Odoacer’s army, including his chief general, Tufa, surrendered to the Ostrogothic king. The following summer, the Visigothic king Alaric II demonstrated what Wolfram calls “one of the rare displays of Gothic solidarity” and sent military aid to help his kinsman, forcing Odoacer to raise his siege. On August 11, 490, the armies of the two kings clashed on the Adda River. Odoacer was again defeated and forced back into Ravenna, where Theoderic besieged him. Ravenna proved to be invulnerable, surrounded by marshes and estuaries and easily supplied by small boats from its hinterlands, as Procopius later pointed out in his History. Theoderic the Great was the King of the Ostrogoths and ruler of Italy after defeating the first barbarian king, Odoacer; he ruled Italy in its most peaceful and prosperous period since Valentinian until his death in 526. Theoderic the Great was King of the Ostrogoths, a tribe of Germanic peoples in close relation to the Eastern Roman Empire. Zeno, the emperor of the Eastern Roman Empire, enlisted Theoderic to defeat the current King of Italy, Odoacer. Theoderic defeated and killed Odoacer and took over as ruler of Italy, where he reigned successfully for 33 years. Under Theoderic, a considerable degree of Roman and Germanic cultural and political fusion was achieved; slowly but surely, the distinction between Germanic rulers and Roman subjects faded, followed by varying degrees of “cultural assimilation,” which included the adoption of the Gothic language by some of the indigenous people of the former Roman Empire. Theoderic died in 526 while planning an expedition to restore his power over the Vandal kingdom; his death soon led to the collapse of the Ostrogothic reign. Zeno: Eastern Roman Emperor from 474–475 and again from 476–491, whose reign saw the end of the Western Roman Empire under Romulus Augustus. Ostrogoths: The eastern branch of the Germanic tribes; they traced their origins to the Greutungi, a branch of the Goths who had migrated southward from the Baltic Sea and established a kingdom north of the Black Sea during the 3rd and 4th centuries. Visigoths: The western branches of the nomadic tribes of Germanic peoples referred to collectively as the Goths. Theoderic was born in Pannonia in 454, after his people had defeated the Huns at the Battle of Nedao. His father was King Theodemir, a Germanic Amali nobleman, and his mother was Ereleuva. Theoderic grew up as a hostage in Constantinople, received a privileged education, and succeeded his father as leader of the Pannonian Ostrogoths in 473. Settling his people in lower Moesia, Theoderic came into conflict with Thracian Ostrogoths led by Theodoric Strabo, whom he eventually supplanted, uniting their peoples in 484. Emperor Zeno subsequently gave Theoderic the title of Patrician and the office of Magister militum (master of the soldiers), and even appointed him Roman Consul. Seeking further gains, Theoderic frequently ravaged the provinces of the Eastern Roman Empire, eventually threatening Constantinople itself. In 488, Emperor Zeno ordered Theoderic to overthrow the German Foederatus Odoacer, who had likewise been made Patrician and even King of Italy, but who had since betrayed Zeno, supporting the rebellious Leontius. After a victorious three-year war, Theoderic killed Odoacer with his own hands, settled his 200,000 to 250,000 people in Italy, and founded an Ostrogothic Kingdom based in Ravenna. While he promoted separation between the Arian Ostrogoths and the Roman population, Theoderic stressed the importance of racial harmony, though intermarriage was outlawed. Seeking to restore the glory of Ancient Rome, he ruled Italy in its most peaceful and prosperous period since Valentinian until his death in 526. Memories of his reign made him a hero of German legend as Dietrich von Bern. Theoderic the Great: Bronze statue of Theoderic the Great (by Peter Vischer, 1512–13), from the monument of Emperor Maximilian I in the Court Church at Innsbruck. At the time, the Ostrogoths were settled in Byzantine territory as foederati (allies) of the Romans, but were becoming restless and increasingly difficult for Zeno to manage. Not long after Theoderic became king, he and Zeno worked out an arrangement beneficial to both sides. The Ostrogoths needed a place to live, and Zeno was having serious problems with Odoacer, the King of Italy who had come to power in 476. Ostensibly a viceroy for Zeno, Odoacer was menacing Byzantine territory and not respecting the rights of Roman citizens in Italy. At Zeno’s encouragement, Theoderic invaded Odoacer’s kingdom. Theoderic came with his army to Italy in 488, where he won the battles of Isonzo and Verona in 489 and the battle at the Adda in 490. In 493 he took Ravenna. On February 2, 493, Theoderic and Odoacer signed a treaty that assured both parties would rule over Italy. A banquet was organized in order to celebrate this treaty. It was at this banquet that Theoderic, after making a toast, drew his sword and struck Odoacer on the collarbone, killing him. Like Odoacer, Theoderic was ostensibly only a viceroy for the emperor in Constantinople. In reality, he was able to avoid imperial supervision, and dealings between the emperor and Theoderic were as relations between equals. Unlike Odoacer, however, Theoderic respected the agreement he had made and allowed Roman citizens within his kingdom to be subject to Roman law and the Roman judicial system. The Goths, meanwhile, lived under their own laws and customs. In 519, when a mob burned down the synagogues of Ravenna, Theoderic ordered the town to rebuild them at its own expense. Theoderic the Great sought alliances with, or hegemony over, the other Germanic kingdoms in the West. He allied with the Franks by his marriage to Audofleda, sister of Clovis I, and married his own female relatives to princes or kings of the Visigoths, Vandals, and Burgundians. He stopped the Vandals from raiding his territories by threatening the weak Vandal king Thrasamund with invasion, and sent a guard of 5,000 troops with his sister Amalafrida when she married Thrasamund in 500. For much of his reign, Theoderic was the de facto king of the Visigoths as well, becoming regent for the infant Visigothic king, his grandson Amalaric, following the defeat of Alaric II by the Franks under Clovis in 507. The Franks were able to wrest control of Aquitaine from the Visigoths, but otherwise Theoderic was able to defeat their incursions. The term “Visigoth” was actually an invention of this period. Cassiodorus, a Roman in the service of Theoderic the Great, invented the term “Visigothi” to match that of “Ostrogothi;” he thought of these terms as signifying “western Goths” and “eastern Goths” respectively. The western–eastern division was a simplification (and a literary device) of 6th-century historians; political realities were more complex. Both tribes had variable relations with Rome throughout their history, ranging from direct conflict to treaties and mutual support. Theoderic’s achievements began to unravel even before his death. He had married off his daughter Amalasuntha to the Visigoth Eutharic, but Eutharic died in August 522 or 523, so no lasting dynastic connection of Ostrogoths and Visigoths was established. In 522, the Catholic Burgundian king Sigismund killed his own son, Theoderic’s grandson, Sergeric. Theoderic retaliated by invading the Burgundian kingdom and then annexing its southern part, probably in 523. The rest was ruled by Sigismund’s Arian brother Godomar, under Gothic protection against the Franks who had captured Sigismund. This brought the territory ruled by Theoderic to its height (see map below), but in 523 or 524 the new Catholic Vandal king Hilderic imprisoned Theoderic’s sister Amalafrida and killed her Gothic guard. Theoderic was planning an expedition to restore his power over the Vandal kingdom when he died in 526. Europe in 526: The Ostrogothic Kingdom (in yellow) at the death of Theoderic the Great in 526 AD. Vikings originated in Scandinavia and raided, traded, explored, and settled in wide areas of Europe, Asia, and the North Atlantic islands. The late 8th to the mid-11th centuries is commonly known as the Viking Age of Scandinavian history. Vikings were renowned for their ships, which were an integral part of their culture, facilitating, trade, exploration, and warfare. Weapons indicated the social status of a Viking, and warfare and violence were heavily influenced by pagan religious beliefs. The Vikings established and engaged in extensive trading networks throughout the known world and had a profound influence on the economic development of Europe and Scandinavia. Vikings are often thought of as brutal warriors due to the manner in which they settled in the northeast of England, though in recent years they have been recognized for their technological skills and seamanship. Viking culture and stories were written about in the Sagas, stories compiled almost one to three hundred years after Viking raids had mostly ceased. When settling land in Greenland and Iceland, Vikings established their form of democratic government which included discussion of rules of law and other issues during Things, assemblies open to all free people. longship: A Viking ship intended for warfare and exploration and designed for speed and agility. Longships were equipped with a sail as well as oars, making navigation independent of the wind possible. Obotrites: A confederation of medieval West Slavic tribes within the territory of modern northern Germany. Charlemagne: A ruler of the Carolingian Dynasty renowned for his thirty-year military campaign to spread Christianity in Europe and for his interests in education and religion. Constantinople: The capital city of the Roman, Byzantine, Latin, and Ottoman empires. During the 12th century, it was the largest and wealthiest city in Europe. Scandinavia: A historical and cultural-linguistic region in northern Europe characterized by a common Germanic heritage and related languages. It includes the three kingdoms of Denmark, Norway, and Sweden. Vikings were Norse seafarers who originated in Scandinavia and raided, traded, explored, and settled in wide areas of Europe, Asia, and the North Atlantic islands. The period from the earliest recorded raids in the 790s until the Norman conquest of England in 1066 is commonly known as the Viking Age of Scandinavian history. Vikings used the Norwegian Sea and Baltic Sea for sea routes to the south. There have been several archaeological finds of Viking ships of all sizes, providing knowledge of the craftsmanship that went into building them. There were many types of Viking ships, built according to their intended uses, though the most iconic type is probably the longship. Longships were intended for warfare and exploration, designed for speed and agility, and equipped with oars to complement the sail, making navigation independent of the wind possible. It was the longship that allowed the Norse to “go Viking” (on an expedition), which might explain why this type of ship has become almost synonymous with the concept of Vikings. Longships were the epitome of Scandinavian naval power at the time, and were highly valued possessions. Model of a Viking longship: Model of the Gokstad ship. The Gokstad ship is a Viking ship found in a burial mound at Gokstad farm in Sandar, Sandefjord, Vestfold, Norway. Dendrochronological dating suggests that the ship was built around 890 AD. Ships were an integral part of Viking culture. They facilitated everyday transportation across seas and waterways, exploration of new lands, raids, conquests, and trade with neighboring cultures. They also held a major religious importance; magnates and people with a high status were sometimes buried in a ship along with animal sacrifices, weapons, provisions, and other items. Our knowledge about the arms and armor of the Viking age is based on archaeological finds, pictorial representation, and to some extent on the accounts in the Norse sagas and Norse laws recorded in the 13th century. According to custom, all free Norse men were required to own weapons and were permitted to carry them all the time. Weapons were indicative of a Viking’s social status; a wealthy Viking would have a complete ensemble of a helmet, shield, mail shirt, and sword. A typical bóndi (freeman) was more likely to fight with a spear and shield, and most also carried a knife and side-arm. Bows were used in the opening stages of land battles and at sea, but they tended to be considered less “honorable” than a weapon that could be used in close combat. Vikings were relatively unusual for the time in their use of axes as a main battle weapon. The warfare and violence of the Vikings were often motivated and fueled by their belief in Norse religion, focusing on Thor and Odin, the gods of war and death. Apart from two or three representations of (ritual) helmets with protrusions that may be either stylized ravens, snakes, or horns, no depiction of the helmets of Viking warriors, and no preserved helmet, has horns. The stereotypical Viking helmet was thus mainly a fiction of a later romanticized image of the Viking. The formal, close-quarters style of Viking combat (either in shield walls or aboard “ship islands”) would have made horned helmets cumbersome and hazardous to the warrior’s own side. The Vikings are believed to have engaged in a disordered style of frenetic, furious fighting, although the brutal perception of the Vikings is largely a misconception, likely attributed to Christian misunderstandings regarding paganism at the time. Facilitated by advanced seafaring skills, Viking activities at times also extended into the Mediterranean littoral, North Africa, the Middle East, and Central Asia. Following extended phases of exploration on seas and rivers, expansion, and settlement, Viking communities and polities were established in diverse areas of northwestern Europe, European Russia, and the North Atlantic islands, and as far as the northeastern coast of North America. During their explorations, Vikings raided and pillaged, but also engaged in trade, settled wide-ranging colonies, and acted as mercenaries. This period of expansion witnessed the wider dissemination of Norse culture while simultaneously introducing strong foreign cultural influences into Scandinavia itself, with profound developmental implications in both directions. Vikings under Leif Ericsson, the heir to Erik the Red, reached North America and set up a short-lived settlement in present-day L’Anse aux Meadows, Newfoundland and Labrador, Canada. Longer and more-established settlements were formed in Greenland, Iceland, Great Britain, and Normandy. 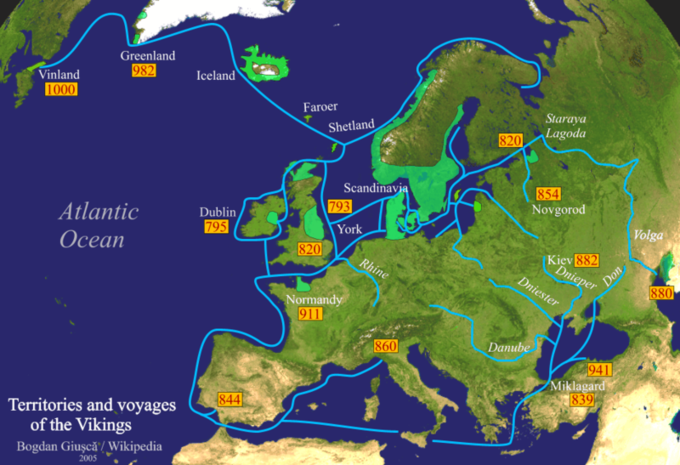 Viking expansion into continental Europe was limited. Their realm was bordered by powerful cultures to the south. Early on it was the Saxons, who occupied Old Saxony, located in what is now northern Germany. The Saxons were a fierce and powerful people and were often in conflict with the Vikings. To counter the Saxon aggression and solidify their own presence, the Danes constructed the huge defense fortification of Danevirke in and around Hedeby. The Vikings soon witnessed the violent subduing of the Saxons by Charlemagne in the thirty-year Saxon Wars from 772–804. The Saxon defeat resulted in their forced christening and the absorption of Old Saxony into the Carolingian Empire. Fear of the Franks led the Vikings to further expand Danevirke, and the defense constructions remained in use throughout the Viking Age and even up until 1864. The south coast of the Baltic Sea was ruled by the Obotrites, a federation of Slavic tribes loyal to the Carolingians and later the Frankish empire. The Vikings, led by King Gudfred, destroyed the Obotrite city of Reric on the southern Baltic coast in 808 and transferred the merchants and traders to Hedeby. This secured their supremacy in the Baltic Sea, which endured throughout the Viking Age. The 200-year Viking influence on European history is filled with tales of plunder and colonization, and the majority of these chronicles came from western witnesses and their descendants. Medieval Christians in Europe were totally unprepared for the Viking incursions and could find no explanation for their arrival and the accompanying suffering they experienced at their hands, save the “Wrath of God.” More than any other single event, the attack on Lindisfarne demonized perception of the Vikings for the next twelve centuries. Not until the 1890s did scholars outside Scandinavia begin to seriously reassess the achievements of the Vikings, recognizing their artistry, technological skills, and seamanship. Studies of genetic diversity have provided scientific confirmation to accompany archaeological evidence of Viking expansion. They additionally indicate patterns of ancestry, imply new migrations, and show the actual flow of individuals between disparate regions. Genetic evidence contradicts the common perception that Vikings were primarily pillagers and raiders. An article by Roger Highfield summarizes recent research and concludes that, as both male and female genetic markers are present, the evidence is indicative of colonization instead of raiding and occupying. However, this is also disputed by unequal ratios of male and female haplotypes, which indicate that more men settled than women, an element of a raiding or occupying population.